This entry was posted in Force Protection, patrol boat, Ports Waterways and Coastal Security by Chuck Hill. Bookmark the permalink. Not that it all happened today, this actually goes back to October, but definitely a good year. These boats are replacing the many old harbor and inshore boats the Navy has once part of the MESF. 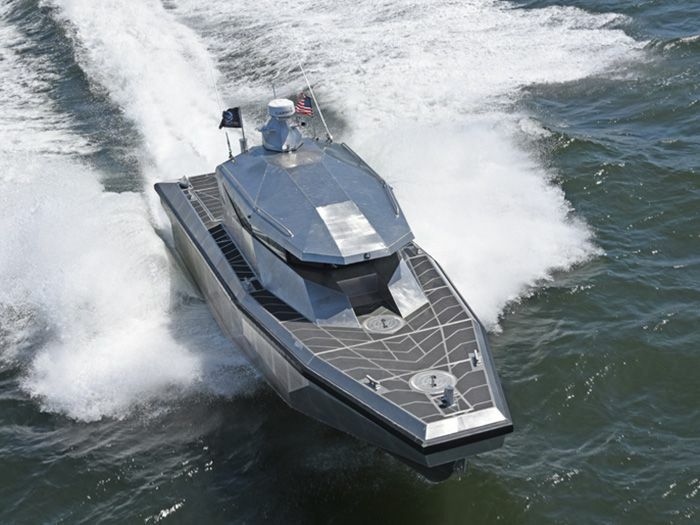 While NEMO is a good weapon, not sure it is intended for this class/ize of patrol boat? There are drawings of the PBX with a Mk 38 on the bow. Rather, I think that weapon would be good on the also new and larger NCPV that the US Navy is building for “United States partner nations being procured for FMS” our neighbors to the south. Metal Shark will build up to thirteen 85-foot Defiant-class welded aluminum cutters for the Dominican Republic, El Salvador, Honduras, Costa Rica, Guatemala, and other United States partner nations. Additionally, Metal Shark will supply electro-optical infrared sensors, diagnostic equipment, in-country reactivation, crew familiarization, and test support to NCPV operators. The new vessels are based on Damen Shipyards’ Stan Patrol 2606 design, tailored by Metal Shark to suit the requirements of the NCPV mission. The versatile cutter can accommodate a wide range of mission profiles including search and rescue, border patrol, police and customs duties, counter-narcotics operations, and securing waters of economic importance.